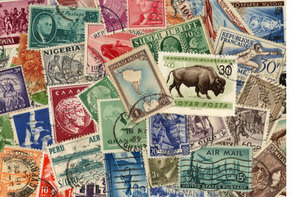 More than 25% of the entire population of the world has collected stamps at one time in their life. Captures the moment – Stamps are all limited issue, and when you get them with a postmark, they very clearly capture a singular moment in time. Because of this, they feel like a historical record. In fact, many stamps are even called "commemorative." The stamps I picked up in Peru are different to the ones you would get if you went a few months from now. That makes my collection unique. Offers a global universality – Just about every country has postage and mail, and therefore every one has stamps. You may not find shot glasses or little spoons, or all the other things people collect in every country, but you will always be able to get stamps. Has a real value – Every stamp has a real value associated with it, and is usually worth more over time. When you buy one, the amount you paid is usually printed on it. The value is therefore very obvious, and makes it feel significant. You might throw away other souveniers or things you pick up while travelling, but few people ever throw away a stamp. It just feels like throwing away money. Always changing – Every year, countries issue many different designs of stamps. More recently, these stamps mirror recent events, are released in interesting sets and come in all shapes and sizes. As a result, there is plenty of variety. Stamps are colorful, plentiful and always different. Next time you pass a post office in any country, pay attention to how they are using their philately to promote the country, cater to tourists, or commemorate moments of significance. People there don’t send that much mail. The stamps are just a smart hook that makes sense because it offers something unique to travelers. It’s no wonder at least everyone’s tried it at least once.